Mary is out the door with a van load of goodies for the Colors of Stockton quilt show presented by the Calico Clippers. It is at the Zumwalt Expo Center. Hours are Friday 10-6 and Saturday 9-3. Admission is $5. Mary had a great time in Stover earlier this month and we have new kits and products for this event, too. 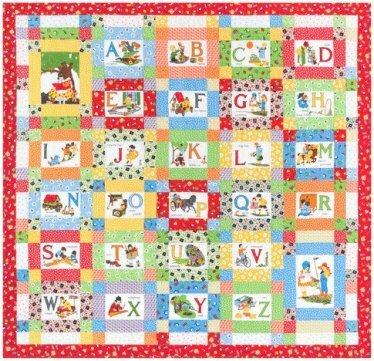 We have a new kit featuring Darlene Zimmerman's "My ABC Book". You know it will have that retro look since she is famous for her 30's inspired fabrics! A panel, a jelly roll, and a little extra makes a quilt almost 60" square. A great learning tool for any child. Find the letter, the picture, match the colors and more! Simple sewing, too. Watch Jenny Doan's tutorial relaeased Friday 4/28/17 featuring this quilt with a wave border. Darlene Zimmerman is her guest and they show you how to finish it. That wave border really gives it an extra zing! We have some new florals just in time for spring sewing. They would make great bags, garments, curtains, etc. and we have plenty of fabrics that mix well with these, too! Drool over these! I can just imagine a wristlet or bag mixed with one our new Essex linens. Essex linens are a blend of 55% linen and 45% cotton. They wash well and make a really professional looking bag. I am using one for a whole cloth applique quilt right now. One of the best things about having a partner in business (and I have the best!) is you have someone to share your joys and challenges as well as brainstorm ideas. So first we are developing a list of things to investigate when we go to Quilt Market in a few weeks. We'll be looking for ideas for Block of the Months, new techniques, and more. Oh, it will be nice to see some of our friends from the Business Retreat we attended in Hamilton. We have business buds all over the US and Canada. And some of the designers have become our email buddies so it will be nice to meet them in person. Mary has not been to market before---she says she will have her eye out for Kaffe! And we are planning a retreat after school starts--probably later in September. Details will come later when we have the venue confirmed. And Row by Row is just around the corner! Our license plates arrived today and they are sooooo cute! Well, Sew Long for now!